Mangaluru, Sep 30,2017: Lifeguards of Panambur Beach Tourism Development Project (PBTDP) had a night mare of a day at the beach on Sept 29, Friday. Rescuing six youths from a certain watery grave in two separate incidents was a huge task. Both these rescue exercises happened in a span of a little over 90-minutes starting 4pm, Yathish Baikampady. While the first group was from Vittal near Bantwal, the second was a group of tourists from Bengaluru. In the first rescue attempt, the lifeguards saved Rohith, 22, Nishanth, 23 and Rajesh, 28, all from Mangalamoda in Vittal. 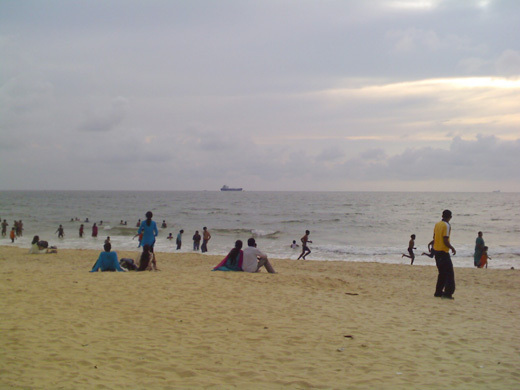 They were among a group of six tourists who had descended on the beach to enjoy the long weekend. Yatish said the youths who ventured deeper in to the water were caught in the rip current and dragged seawards. The timely efforts by the lifeguards ensured that they were pulled out of the sea and administered first aid. Even as the lifeguards were coming out of the shock of this rescue, they were called in to action, this time to save Ramesh, 28, Raju, 27, and Karan, 28, from Bengaluru. They were part of tourists who had come to the beach.